Hello! Following the last blog post, I'll write about my observation and experience in Jogjakarta, Indonesia. Borobudur is a Buddist stupa and temple complex dating from the 8th century, and one of the most famous UNESCO World Heritage Sites in Indonesia. Borobudur Temple was once abandoned and left to the wilds of nature until the English governor, Thomas Stamford Raffles sent his people to dig away at the earth to reveal the temple. The temple compounds restored by a team including a Japanese engineer is now Indonesia's important tourist resource. The monument has a pyramidal base with five concentric square terraces, the trunk of a cone with three circular platforms, and at the top, there were many stupas each containing a statue of the Buddha.I saw many tourists trying to reach and touch the Buddha statue's hands inside a stupa to receive good fortune. I felt sorry to see some tourists paying little respect to this buddhist temple complex to climb up the sacred monument despite the signage that forbids such behavior. 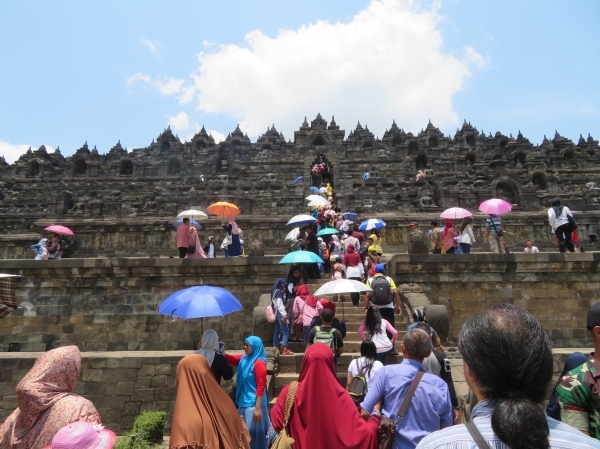 In Indonesia where Islam is more popular than Buddhism, Borobudur seemed to wind up as a mere tourist spot rather than a destination for a Buddhist pilgrimage. 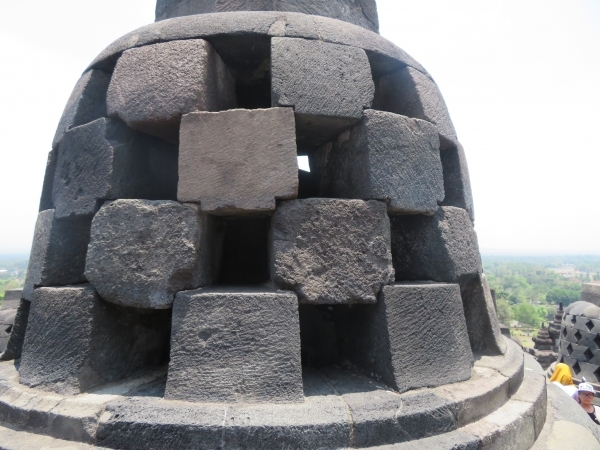 In principal, religious facilities and cultural assets are considered as the source of pride for residents, but as the case of Borobudur shows, due to such reason as colonization, some places could be ignored by local citizens and residents. That is why, I hope Buddhists and religious travelers coming from around the world would take over this sacred monument. 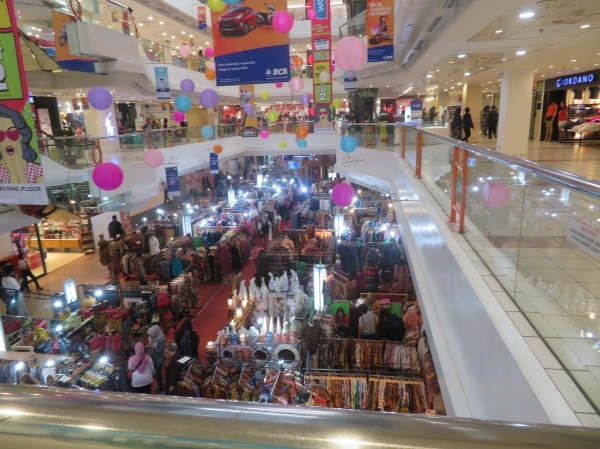 Lastly, my impression of downtown Jogjakarta could be summarized as too many people and goods. There were also many cars and motorbikes running. It is no wonder that Indonesia has the world's fourth largest population. Marioboro Street in downtown Jogjakarta was filled with local merchandise items such as Batik. Modern shopping centers were also flooded with goods. I was wondering if Indonesia was at the developmental stage where people felt happiness by the abundance of goods. The whole town felt like the store "Don Quihote." People's livelihoods were seen from backstreets, and among many people, I felt as if I got a hang-over in Jogjakarta where it is difficult to get alcoholic drinks under Islamic cultural influence. 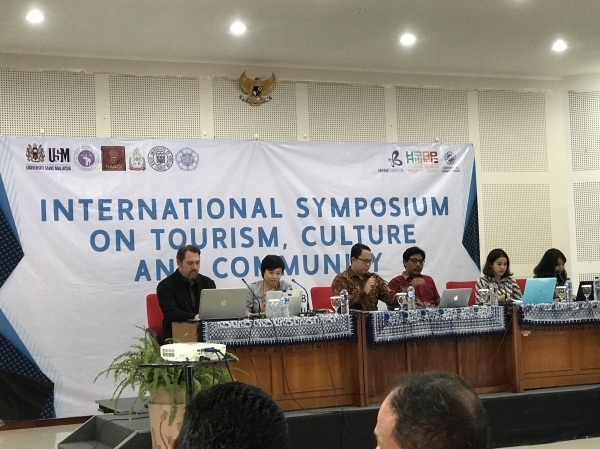 Kyoto University of Foreign Studies has been conducting a joint tourism research project with the following five ASEAN universities: Universiti Sains Malaysia, Chiang Mai University, Vietnam National University, Hanoi, Gadjah Mada University, Souphanouvong University, and the researchers from these universities gathered for this symposium. 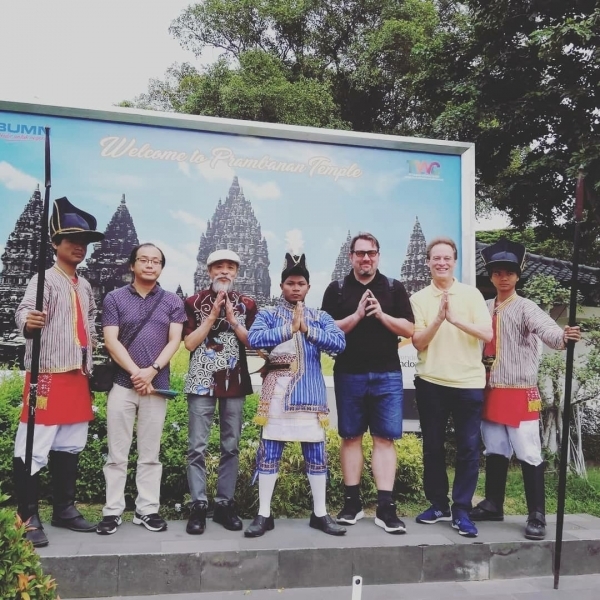 In addition to attending the symposium, we did some fieldwork in the downtown of Yogyakarta and the surrounding world heritage sites and religious sightseeing spots. Today and next week, I am going to report on my field observation and insight based on this fieldwork. We visited the Prambanan Temple Compounds which is a UNESCO World Heritage site. At the the center in a vast site, there is a 100 square meter stone foundation where the restored 47-meter tall Shiva temple and the 27-meter Brahma and Vishnu temples on either side form the centerpiece of the complex. In front of the three towers, there is a small shrine that worships their carriers or Vahana (Nandi, Gardura, and Hansa). Additionally, nearly 100 small temples were observed in the surrounding area, and most of them had remained disassembled since the major earthquake in the 16th century which destroyed many of the temples and left much of the area in ruins. Despite that, the beauty of the temple compounds that were partially restored in the 20th century was striking. There was a small fee to enter the site. Near the entrance there were three men in costumes, and tourists are able to take photos with them. Not only that, a commemorative plate that says "Prambanan" was also available for tourists. I saw various services (around 200 yen) to help tourists take “Instagrammable” photogenic pictures. It was also very impressive to see female tourists wearing Indonesian costumes walking along the temple compounds. The scene was just like the one in which Japanese Maiko and Geiko women marching in Kyoto. The achromatic earth colors of the site seems to fit with the glittering costumes. It resembles the historic town of Kyoto where Japanese traditional banners and curtains are well-suited. The leaves have turned red here in Kyoto. I hope you are enjoying your autumn! Today, I'm going to talk about "Community Engagement," which forms the core of what we study in the Faculty of Global Engagement. It is a project aimed at tackling and resolving social issues by working together with members of communities throughout the world. 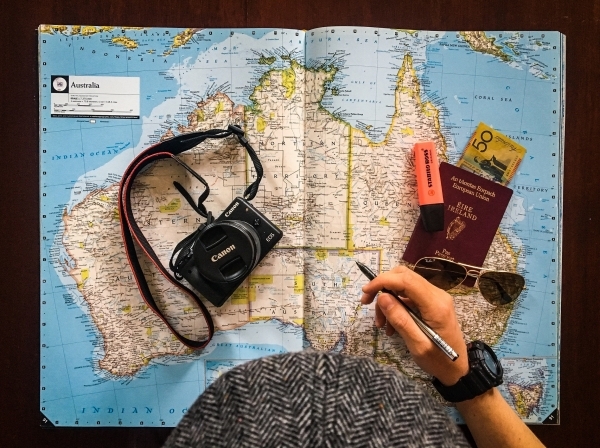 For the year 2019, there are eight programs for Global Tourism students as follows. ・Guam Program with KNT-CT Holdings Co., Ltd.
・Vietnam(Ho Chi Minh City）with KNT-CT Holdings Co., Ltd. This program includes a 5-week study at the Burwood Campus of Deakin University in Melbourne, Australia plus 1-week community engagement activities at KUFS. On weekdays, participants will study English in the morning at the campus with international students coming from 100 countries. Weekday afternoons and weekends will be used for conducting group-based fieldwork research and compiling project reports related to tourism themes. 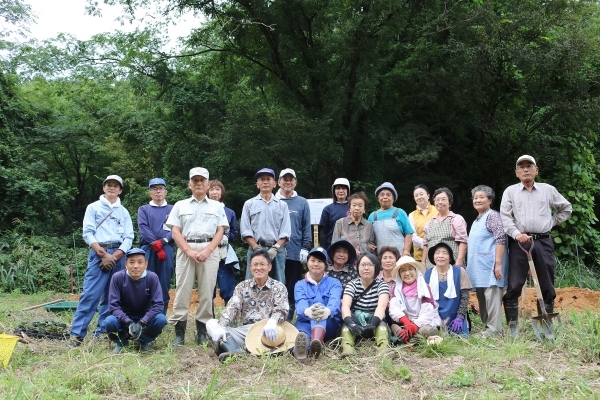 This program is based on the field museum project in which KUFS has continued its partnership with the residents of Echizencho since 2013. Participants will be given chances to learn about such themes as marginal settlements, sustainable organic agriculture, and the restoration of the traditional Echizen pottery through their active involvement in fieldwork research, solution making, and social experiments. 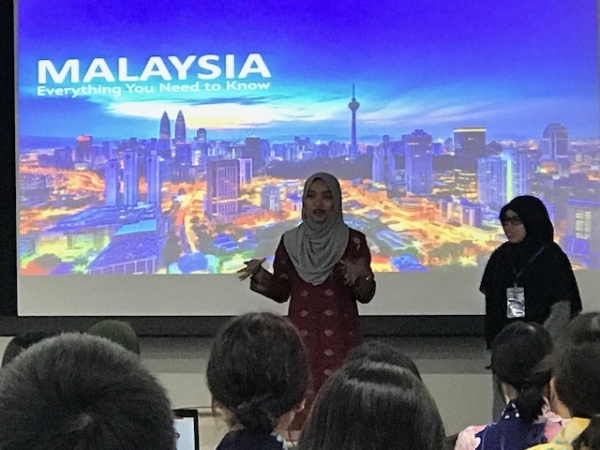 Here is another report from the student team of the Asian Youth Forum. Sakura Endo, a first year student at the Department of Global Toutism, is going to share her experience of the AYF focusing on the presentation she made with her classmates on November 3rd. We talked about the following two main points in our presentation. The Department of Global Affairs at Kyoto University of Foreign Studies offers a variety of classes related to global tourism and foreign languages. For instance, some of these classes deal with such issues as world heritage sites and SDGs(Sustainable Development Goals) while other classes are more language-based providing students with chances to learn how to make English presentations, to prepare for TOEIC, and to study foreign languages other than English. In addition, the Department offers a number of extracuriiculum activities in which students can learn deeply about Kyoto culture. 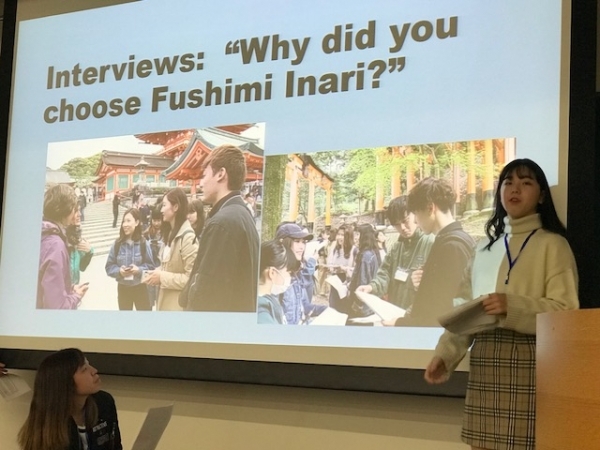 Since April, we have conducted fieldwork research in such places as Fushimi Inari in Kyoto and Awara in Fukui and presensented our findings on and off campus. Over all, our presentation was well received by the audience as a result of our one-month preparation. However it was fairly challenging to answer to the questions from the audience. We received useful suggestions from our AYF advisors regarding how we can better prepare ourselves for the next oppotunity. It was a great learning opportunity. Thank you very much. Hello! 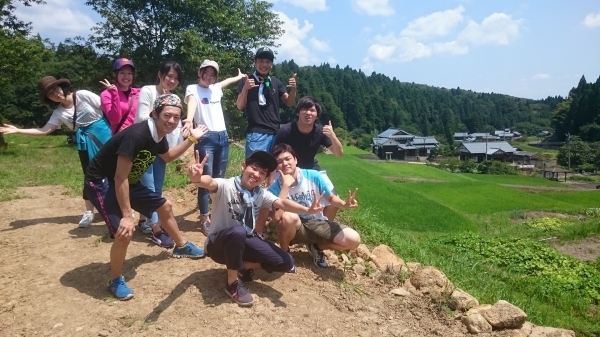 I'm Ayumi Uratani, a first-year student in Global Tourism studies at Kyoto University of Foreign Studies. 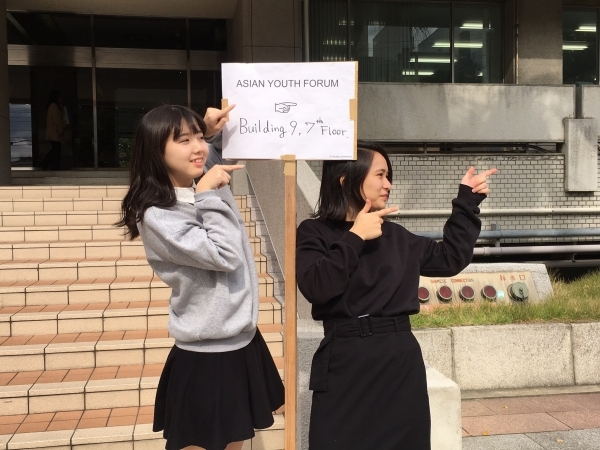 Today I would like to report on what I experienced at the Asian Youth Forum (AYF). 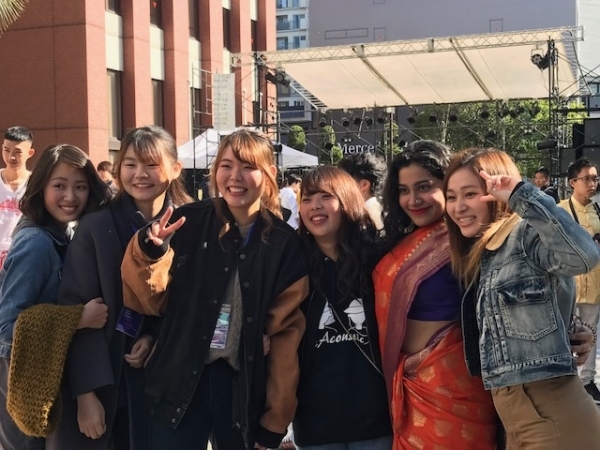 From the Department of Global Tourism, 5 students participated in the event as full participants, and 9 students worked as student volunteer staff. As a host of this event, we spent weeks preparing by working in 3 groups. 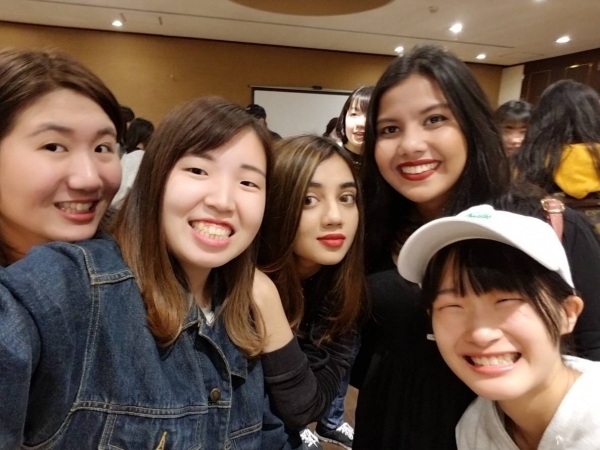 On the first day of the event, each KUFS student group escourted and assisted domestic and foreign guest participants with their event and hotel check-in, and all participants enjoyed themselves at a welcome pizza party. 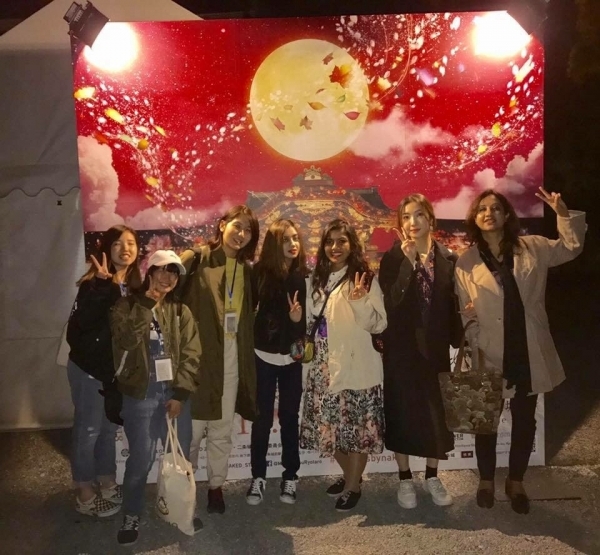 On the 4th day, after the programs, my classmates and I had the chance to take the guests from Bangladesh and Korea to Nijo Castle for sightseeing. From this experience, I learned the challenges of hosting and serving guests. There were many things to think about from trip planning to providing tour guides. But at the same time, I found fulfillment creating enjoyable experiences for the guests through tourism. It was also difficult to communicate with the guests in English. However, all these challenges made me become more aware of what needs to be done to host guests better. The 6 days of the AYF turned out to be a good learning experience for me.